These are two types of vegetables from our garden, both from Moraceae family(same family as jackfruit). These are two of the most popular vegetables used in everyday cooking, during season. PS: Some people call the first one as Neerpanas or Jeev Kadagi. We had a big discussion about this before on this blog, I am using the names that we use at our place with descriptions of why we call them so. Please feel free to call them by the name you want, here the focus is about the culinary usage and not on the names again. Thanks for understanding. 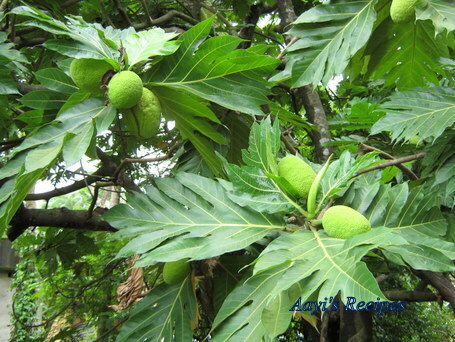 Palapanas(Konkani) or Ber Halasu(Kannada) or Breadfruit – The reason we call it Ber/Beru(Kannada) or Pala(Konkani) – meaning root is, the new saplings of the tree come from roots of this tree. These fruits do not have any seeds in them. The outer skin does not have very sharp spikes. The leaves of this tree are slightly thinner and smaller than the other variety. The tree requires a lot of water to survive. Discard the outer green layer and white portion in the center(which is clearly visible). Neerpanas(Konkani) or Neer Halasu (Kannada) – We could not find the English name of this variety. This is not as common as the above variety. I was not aware of this variety before my marriage. Looks like this is prominent below ghats. The tree requires lot of water to survive. Unlike the above variety, these have many seeds. New plants grow from these seeds. 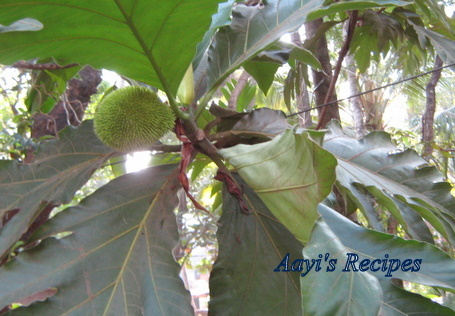 The tree almost looks like breadfruit tree, but the leaves are slightly bigger and thicker. 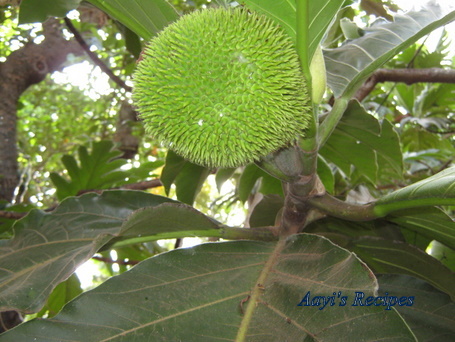 Unlike the breadfruit, they have spikes all over them. When the seeds are tender, they can be used in any preparations, but when they get hard, they have to be discarded. 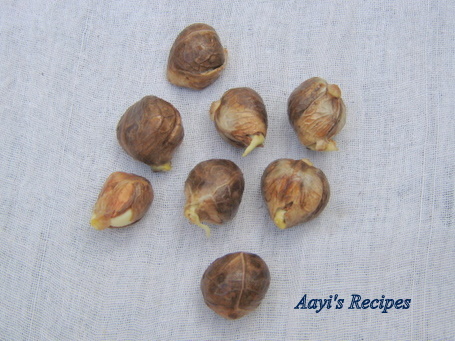 Sometimes the seeds are peeled to remove the outer hard skin and then used in dishes. Neerpanas tastes a lot like tender jackfruit. Neerpanas cannot be used in cooking when it ripens. We open the fruit and take out the seeds. The seeds are a delicacy liked by many. We normally roast them on open fire, take out the hard skin and eat them. When you cut into a fresh palapanas or neerpanas, a white colored gum comes out of it. So usually while cutting them, we immerse them in water. Also some oil is applied to palms as well as knife. 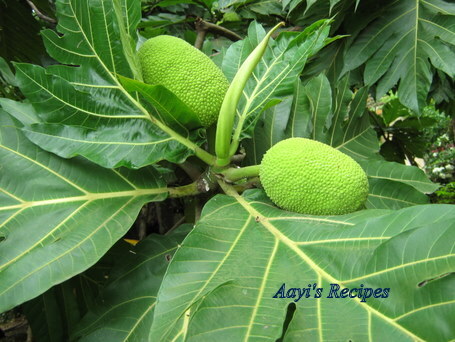 Breadfruit/Palapanas can be used in – Breadfruit and peas sidedish (Otane randayi), Vegetable sidedish(dhoddak/huggi), Sprouted moong daal side dish ( Muga moLe randayi), Rava fry/phodi and many other dishes like dry sidedish(Talasani), chips etc, which I am going to post in future. I will post the recipes with Neerpanas soon. OK! Thank you Mai for this wonderful tutorial! Hope we will get an opportunity to see you this year! I have never seen or eaten the second variety. I love the first one. We call it Jeev Kadagi. Very informative and narrative post. Thanks Aunty, this is such a delightful reading! Wow, I never seen or heard about this vegetables before. What dishes can be made from this vegetables? Wow so many breadfruits… lucky you Mami. Second one is it something people in SK use for gojju ( when it is ripe)? Thanks for the nice tutorial. Long time back I bought the second variety in NJ thinking it as Kadgi… it was a total disappointment. Gowri, the second one cannot be used when it is ripe (atleast as far as we know). The Manglorean konkani speaking people call it Jeev Kadagi. Is that first one the same as Jeegujje? In my Thatha’s (mom’s dad) estate we get a small kind of Jackfruit called Bilava, which has white, slimy, soft but very sweet fruit inside. Ohh..i miss these so much here..thanks for some canned raw jackfruit, atleast I can make phanas bhaji. We used to make phodi/kaap with these !! Thanks for sharing ! The Jeev Kadagi/Breadfruit makes superb, soft and delicious Phodis/Bhajias. Remove outer skin by peeler…………..very thin skin can be removed. Cut vertically, horizontally and make thick slices (at least 1cm thick); apply dry masala (rava, salt, a little mirchi powder, a few drops of lemon and mix). Roll slices in the mixture and deep fry/shallow fry. Cooks very fast………….DO Not brown the pcs. Shilpa, is this jackfruit? Or rather, is it close to a jackfruit? 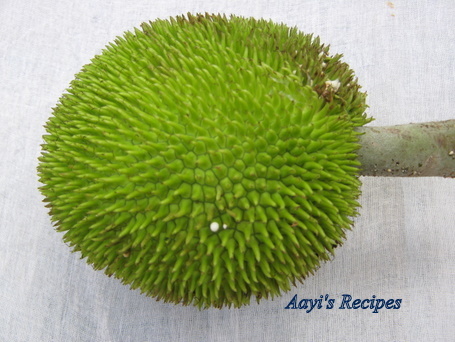 It is from the same family as jackfruit. The first item (we call it jeev kadgi) is used to make sukkay,upkari, phodis and bajjis by my mother . The 2nd item appears to be PaaccH Ponosu but am not sure. When unripe, the spikes are shaved off and it is preserved in salt water. This preserved item is made into a gojju . This is a typical poor man’s food and is a village dish for people who don’t have or can’t afford fresh veggies. When ripe this is a mushy, sweet, yellow fruit. The skin is crumbling and can be peeled off with our fingers and each pod is popped into the mouth, the fleshy outer layer is consumed and the seed is spit out. I have never eaten this fruit/vegetable before although I have heard that it has avery pungent aroma but is delicious when cooked. Weird that it is not Pacch ponosu. I was pretty sure it was. Simply may be thinking about durian . Never heard of a durian in India and I think it is a chinese/S’pore/Malay product. SS, one more reader is also saying Neerpanas is called as pachponos. But I have a picture in my old post where some people from Mangalore said the second picture in that post is called pachponos. The variety in that picture and Neerpanas are not same. Neerpanas and Palapanas trees look almost same. Have you seen the tree? 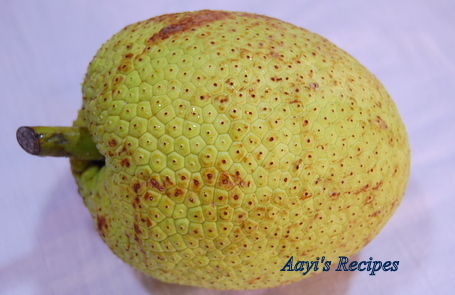 I love breadfruit… we fry thin slices of it. Or make a caldeen curry with prawns. I believe in Africa – where it originated from – it is tossed whole into the bonfire and then split down the middle and smothered with butter! 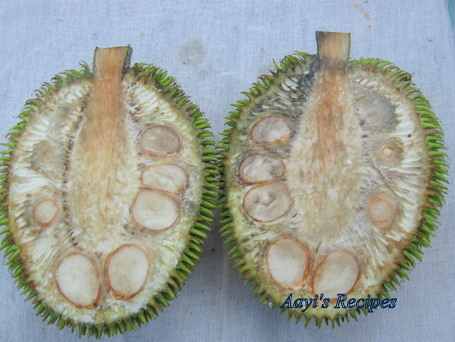 I have come across a fruit quite similar to this in Sabah, Malaysia, the local call it Tarap but not too sure about it. Can anyone confirm this? Checked Tarap pictures on google. Its not the same. Yes that old photo you posted in comments appears to be pacch ponosu but I have never seen the trees, never seen or heard of neer ponos . Thing is I only visited M’lore as a kid a few times and don’t have much info. Congratulations!Your name has been recommended as site for the day in the Times Of India, Mumbai..Wow, keep up the good work. In Indonesia, we call it : SUKUN (Shoo Khoon). It’s commonly deep-fried as snack, from the medium ripe one. If it’s rippen, it will contain sugar and delicious to be made as fried cake or baked cake. There was also a fruit called Paasponos that I had as a child. Years since I went to Mangalore and it is only in my imagination. If you could get a picture of that, I could go back in time! I really like the description of the two fruits that you have given.I visit your site often and always get to learn something new and innovative.Thank you.I also just started a blog of my own and am making small steps at a time. My parents used to call it Divi gujje and Hebalsina hannu. Very rarely we used to get divi gujje in mumbai. We used to feast on hebalsina hannu when we went to Mangalore. My mom would bring preserved hebalsina hannu from M’lore and make neer upinakai throughout the year… beautiful memories. Thank you Shilpa for your well-organized hardwork. In kerala we call this as sheema chakka. it is used as a vegetable. its also made into a sweet using jaggery and coconut. years since i had it . this fruit reminds me of my childhood. we still have the tree in our ancestral house in kerala. the picture has brought back memories.thank you. We call the second fruit as Palponos in Konkani in M’lore. Here is the picture of the same at below link. Where can I get this vegetable? is it sold in grocery stores? neerpanas We call this vegetable as Deeguje . We Will grow this Vegetable . If anyone interested Please free to call my cell number . Hi Ketan, I think there is some confusion. These are pictures clicked by me from our backyard.